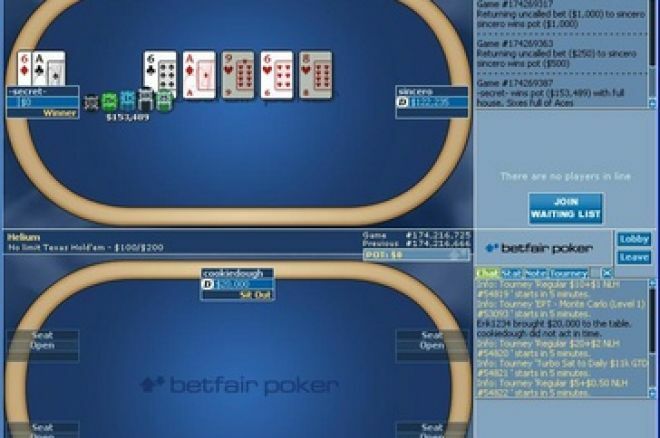 Following a hugely successful World Series of Poker Europe, tournament sponsors Betfair are set to announce revenues have increased by a third since April. The revenue boost has been largely due to an increased effort in their poker portfolio. The revolutionary betting exchange has seen a 57% boost in active users to over 433,000. This lifted like for like revenues 30% to £182 million. Profits did actually decrease from £36.5 million to £25.3 million, but this was largely due to a number one off investments worth around £12 million. Several factors have contributed to this recent success. Betfair are one of the few operators who have never taken bets from American accounts and, therefore, were not impacted by the UIGEA. Meanwhile they have been expanding their operation outside of the UK and have licenses in Malta, Germany, Austria, Australia and soon Italy. But another major part of Betfair's new marketing campaign is their concentration on poker. This year Betfair moved away from their old Tribeca skin to start trading on their own independent poker room instead. More recently they sponsored the hugely successful WSOPE and managed to sign up champion Annette Obrestad as a sponsored player prior to her victory. Betfair also sponsored the European Poker Masters and the Betfair Asian Poker Tour. They have another WSOPE champion in the form of HORSE winner Thomas Bihl and also look after high stakes players such as Ben Grundy. [I] Ed Note: See what all the fuss is about and get a $1000 bonus at Betfair Poker .